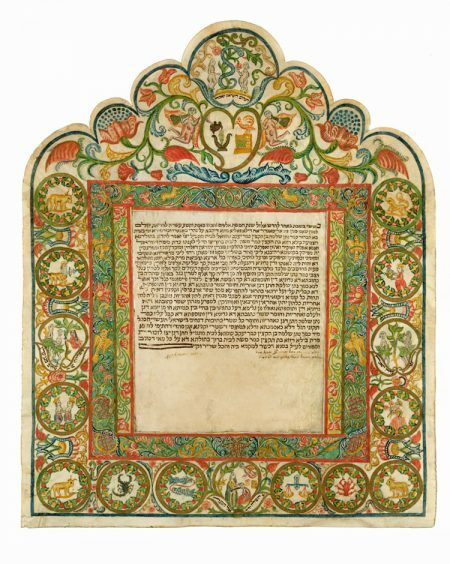 (420 people in 1761), this ketubbah is an example of a special genre that flourished in select Italian towns: sumptuously decorated ketubbot enhanced by cutout designs. The border, however, probably was not produced in Alessandria but in Lugo or Ancona, and later reused for a local wedding; the text section is on a separate piece of parchment glued to the older border. It is clear that a skilled craftsman with the ability to execute intricate cutout designs created the border. These designs comprise the inner rectangular frame that surrounds the text, featuring floral motifs that are interspersed with faunal pairs: perching birds, flying butterflies, and leaping stags (? ), as well as a double-headed eagle at the bottom center. The cutout motifs are enhanced by a green textile, glued behind them, which provides an attractive back- ground for the colorful designs. The exterior frame is decorated with medallions and vignettes containing figurative images. Four vignettes depict biblical episodes, three of which narrate the story of Adam and Eve: the Temptation accompanied by a verse from Genesis 3:13; Adam and Eve donning fig leaves inscribed with Genesis 3:7; and the Expulsion from Paradise with Genesis 3:23. Despite the Christian overtones of this topic, it was deemed appropriate for the ketubbah. The fourth episode (bottom center), more pious and popular in Jewish tradition and art, depicts the Sacrifice of Isaac, and includes the words of the angel to Abraham (Genesis 22:12). The side and bottom borders each contain four gilt roundels depicting the Signs of the Zodiac. The symmetrically arranged signs do not follow the standard astrological order, but are placed in playful and imaginative pairs: Leo at top right parallels Aries at left (mammals); Aquarius parallels Sagittarius (mythological figures); Virgo parallels Gemini (hu- mans); Capricorn parallels Taurus (mammals); Scorpio parallels Cancer (crustaceans); Libra parallels Pisces (twin elements). A pair of angels at the top supports a heart-shaped cartouche with two emblems that, significantly, are not those of the present couple, but of the families for whom the attractive border was initially produced. Tradition Ceremonial Objects, 1970, p. 36.